New York City’s Lee Ranaldo is a founding member of Sonic Youth and, as such, is one of the most gifted and revered guitarists, singers, and songwriters in the history of rock music. When Sonic Youth began a hiatus in the fall of 2011, Ranaldo was already at work on a solo album; the excellent Between the Times and the Tides was released in 2012 and stood as one of the finest records of the year. 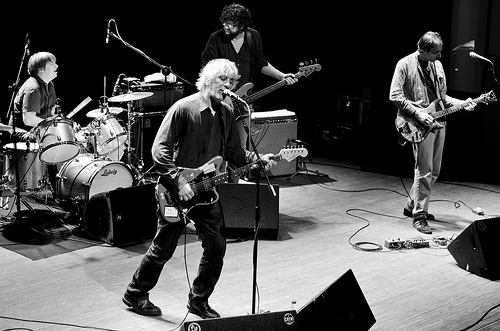 On July 28, Lee Ranaldo and the Dust will perform at the 30th anniversary edition of the Hillside Festival in Guelph, Ontario and, if all goes well, they may preview material from a new album, which is scheduled to be released in October 2013 on Matador Records. Lee and I tend to have nice conversations. This one was no different. It was over Skype though, while he was in Brazil. Related links: hillsidefestival.ca leeranaldo.com matadorrecords.com vishkhanna.com. Listen and subscribe on iTunes.